shutdown at the end the next cycle and move on. We have gained a lot of useful knowledge we can deploy elsewhere, and that was the whole point of the exercise. devolution of the project to its community, maintaining its public mission. This would be an extraordinary outcome: a public policy so appreciated that its beneficiaries step in to do the heavy lifting themselves. But it is a tricky one to pull off, and at this point in time I deem it unlikely to happen for reasons I explain in the video. entrenchment and drift of Kublai into a kind of business planning online help desk, feeding into the plethora of contests for startups, creative projects etcetera. I think this outcome would be tired and – in the context of Italy’s constitutional architecture – not suited to a central government agency. I think it should be avoided. I am curious to see what happens. More info on Kublai here. 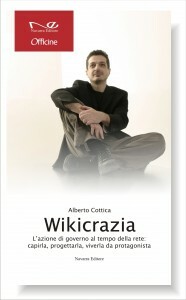 This entry was posted in industrie creative e sviluppo, Open government and tagged creative industries, creatività, creativity, egov20, Kublai, Kublai Camp 2011, online policy, regional development, sviluppo on 24 September 2011 by Alberto.